The mission of Manna for Life Ministries is to reflect the Love of Jesus Christ, and to help people, by meeting needs and planting seeds of Love, Hope, Kindness, and Faith in them. Our goal is to provide food, clothing, household items, transitional employment and job skills. Allowing people to take control of their lives and giving them the ability to live a healthier and more productive life in our community. More importantly we want to guide people into a deeper relationship with God the Father, Jesus Christ and The Holy Spirit. Our array of services include: a food pantry, a soup kitchen, a thrift store, a job training program, and a clothing and furniture voucher program. Together they combine to really make a positive difference in meeting immediate and long-term needs of thousands of people every year in Green Bay Wisconsin. In July of 2007, Manna for Life began serving a hot lunch program to a couple of dozen people a day. With donations from local supermarkets such as Supervalu, Festival Foods, Roundy’s, Austin’s, Walmart, Costco, Sams Club as well as federally funded supplies and foods purchased at Feeding America Food Bank. When the kitchen was closed in2013 we were serving over 150 people day. The soup kitchen is like the kitchen in your own home, the central gathering place, so to speak. This is where the hub of activity between staff and participants takes place. A lot of information is exchanged here and many needs are discovered and the plan to meet them gets its start. Unfortunately, we had to temporarily close our soup kitchen do to the renovation of the new building. Foremost on our mind, with our new facility, is the reopening of the soup kitchen. There is no doubt the need is there. After we made that tough decision to close our soup kitchen the line of hungry people disappeared but the need did not leave our community. When we reopen, we will to be able to serve over 200 people each day a hot (sometimes cold) nutritious lunch every day. 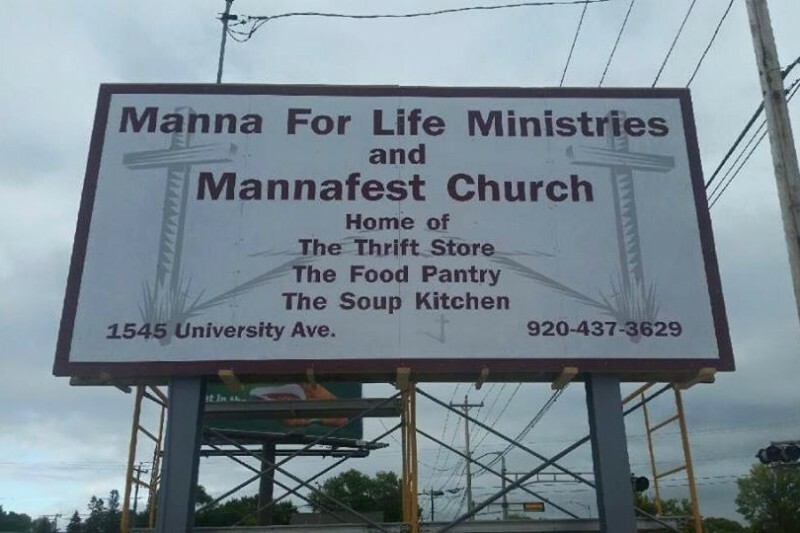 Since 2013 Manna For Life has been raising money to continue contruction on the soup kitchen. Due to many regulations changes some of the equipment and appliances we have do not meet the stardards of the state regulations so we have to replace these items. This process has taken much more time then expected. We have only the hood exhaust fan left to replace. This is the main goal of this money. The hood fan cost close to $25,000.00. We need to have the soup kitchen open as soon as possible. We have been closed for sometime now and really need to begin to start feeding the people again. Every day that it is closed , that is one more day a family may go without food. Manna For Life Minitries would like to extend a sincere thank you for your support and if you would like to stop by and take a tour please feel free to do so. Know that all money donated will go directly to the opening of our soup kitchen and the purchasing of our kitchen hood exhaust fan. Hello Everyone its been a long road but thanks to hard work and your donations our Soup Kitchen is finished. We will be opening soon. We need volunteers to run it or money to pay someone to be employed. Manna For Life Ministries Management Team. For those of you who have been following our progress we have received some large donations and we are only $5,000 away from opening our soup kitchen. I know all of you want this to happen so during this CHRISTmas season think about how many families you can bless by giving a donation. Lets see if by January 1st, 2017 we can reach our goal and begin feeding the people of Green Bay during the new year. The hot lunch we serve will be the only hot meal many of neighbors get in a day. Come on people we have so many hungry neighbors. !